Kacey Musgraves, Dua Lipa, Cardi B and Lady Gaga were among the big winners at the Grammy Awards, making it a good night for female stars. Country star Musgraves picked up four awards, including album of the year, while Childish Gambino also won four. Cardi B made history as the first solo female to win best rap album. British pop star Dua Lipa was named best new artist and paid tribute to the “incredible” line-up of “so many female artists” in the category. This year’s ceremony certainly appeared to be at pains to make amends, with lifetime achievement prizes for Dolly Parton and Diana Ross, and scores of female performers throughout the night. It was the first year in Grammys history that women had won five of the top album awards - album of the year, best pop album (Ariana Grande), best country album (Musgraves), best R&B album (H.E.R.) and best rap album (Cardi B). Grande won her first ever Grammy Award for Sweetener, but wasn’t there to collect it after a dispute with organisers. According to Variety, the Thank U, Next singer also expressed her disdain in a series of since-deleted tweets at the fact Mac Miller, who was nominated posthumously for best rap album, lost out to Cardi B. Accompanied on stage by her husband Offset, Cardi thanked her daughter Kulture Kiari for giving her the impetus to finish the record on time. Lady Gaga won three prizes, including best pop performance for Joanne and best pop duet for Shallow, from the Oscar-nominated film A Star Is Born. Holding back tears, the star thanked Bradley Cooper, her costar and director, who missed the Grammys to attend The Baftas in London. She also used her speech to highlight the film’s mental health message, telling the audience: “If you see someone that’s hurting, don’t look away.” And Emily Lazar, who worked on Beck’s Colors album, became the first woman in Grammys history to win best engineered album. But while the Grammys has made strides with female artists, it still needs to repair its image in the hip-hop community. At one point, host Alicia Keys awkwardly had to fill time when no-one came forward to accept the song of the year award on his behalf. 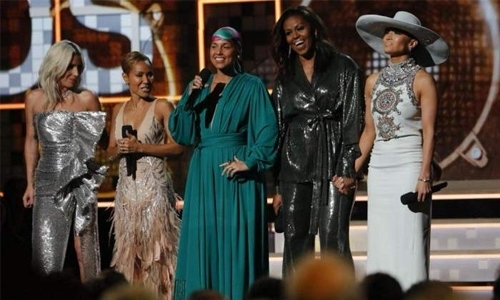 Former first lady Michelle Obama also made a surprise appearance, giving a speech about the unifying power of music alongside Lady Gaga, Jada Pinkett- Smith, Jennifer Lopez and Alicia Keys.